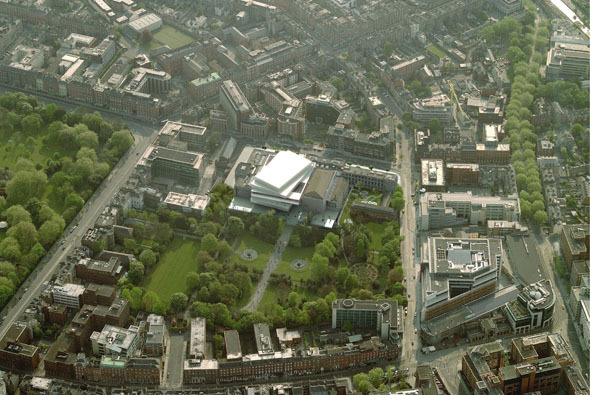 Two Danish studios, 3XN and Henning Larsen Architects, were head-to-head for the design of the new National Concert Hall in Dublin, Ireland. The competition has now been cancelled due to lack of financing as a result of Ireland’s fragile economic situation and the client NDFA will hence not determine a final winner. 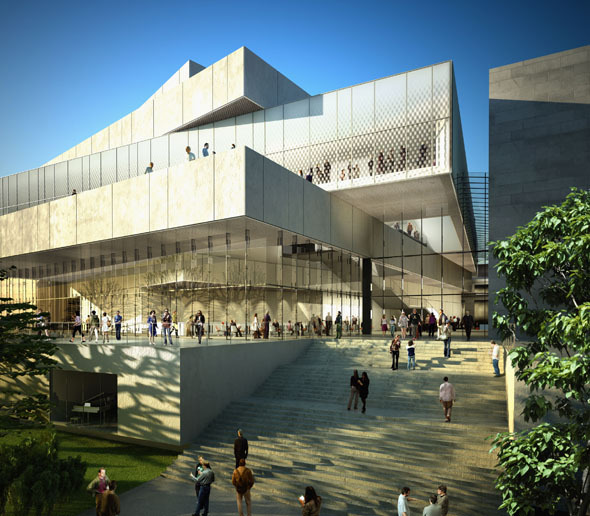 The design concept from Henning Larsen locates the Symphonic Hall at the heart of the site, allowing it to become a pivotal element, conducting the entire National Concert Hall arrangement. 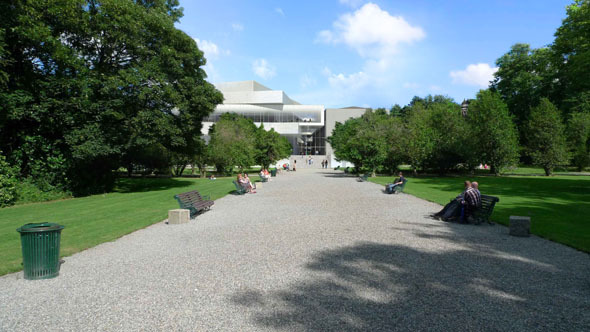 The new courtyard of the Siansa National Concert Hall was intended to become one of the great civic spaces of Dublin and is the creation of openness and light, of clarity and understanding, of new and old. The space provides the surrounding functions with natural light and helps visitors to easily orientate themselves in the new environment. 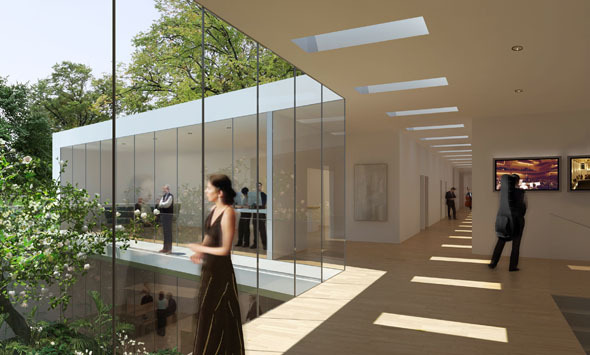 With the open and light courtyard on three sides and the Iveagh Gardens on the last side, a series of interconnecting spaces of changing experiences and drama is created. The courtyard links Earlsfort Terrace with the Gardens, creates a generous entrance foyer to the auditoriums and constitutes a spatial experience connecting all public frontages of the site – making the courtyard part of the public realm. The beauty of the Iveagh Gardens is awakened and transformed into an urban meeting place for the citizens of Dublin. 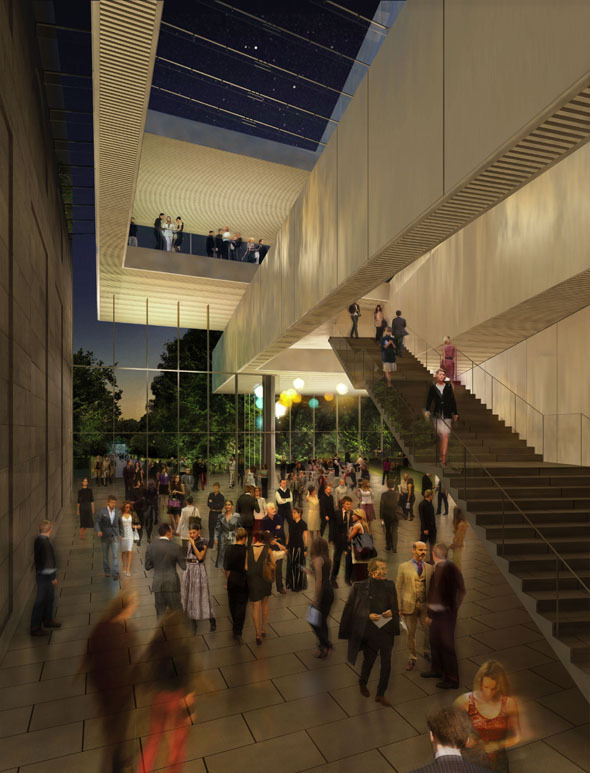 The creation of a vast variety of public spaces in and around the National Concert Hall will revive public life and activity. 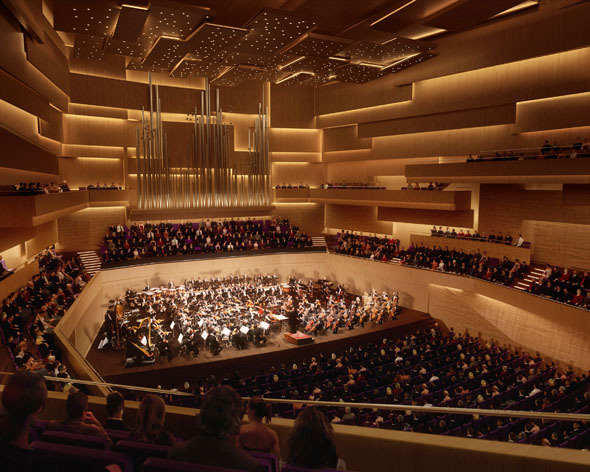 The new Symphonic Hall provides an exceptional environment for symphonic music and sets a new standard for concert hall acoustics in the 21st century. It provides an unsurpassed concert experience. The uniqueness of the Symphonic Hall lies in its lightness and perceived fragility, creating unity and connection between art and audience in the tension and suspense created by live music. The foundation of acoustic excellence is silence. Silence in a large concert hall is awe-inspiring in itself, but it also enables the maestro to create textures and musical nuances that would go unheard in lesser halls. Siansa’s Symphonic Hall provides this silence, but also constitutes a unique masterpiece of a hall that enables musical textures to be communicated to everyone present at a performance. 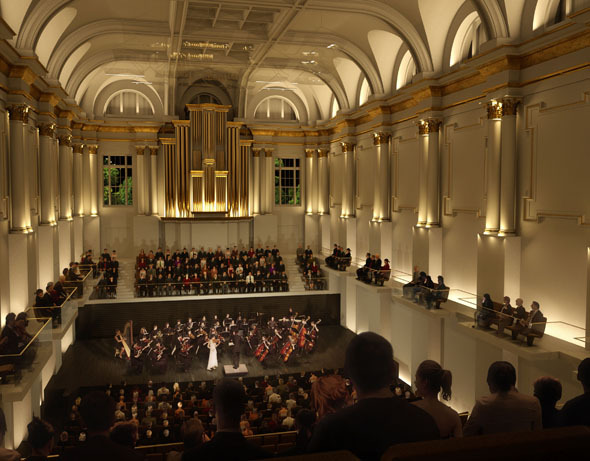 The Symphonic Hall not only supports the intimate atmosphere, but also allows for forte passages, which will exhilarate and enthral audiences. The bonds between the conductor, musicians and audience are immediate and all-involving. The finely crafted acoustics provide a marvellous blend of the musical clarity required to communicate the most delicate of musical textures and a reverberation time ensuring a rich musical and immersive listening experience. Tonally, the sound is balanced between all registers in the orchestra: from luscious singing strings through resonant woodwind to blended brass, all supported by rich bass. Solo instruments and singers shine out with sonorous clarity through the orchestral textures. The hall acoustics and organ work together in harmony providing a blended sound for ensembles, but also have the power to really excite in solo works. 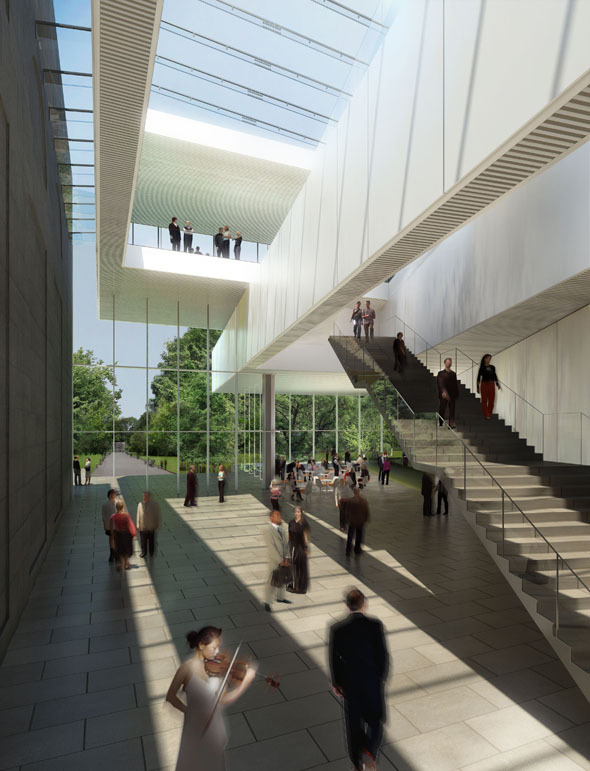 The Symphonic Hall constitutes a unique place in Ireland where listeners can engage fully in the creation and interpretation of symphonic music in an exceptional environment. 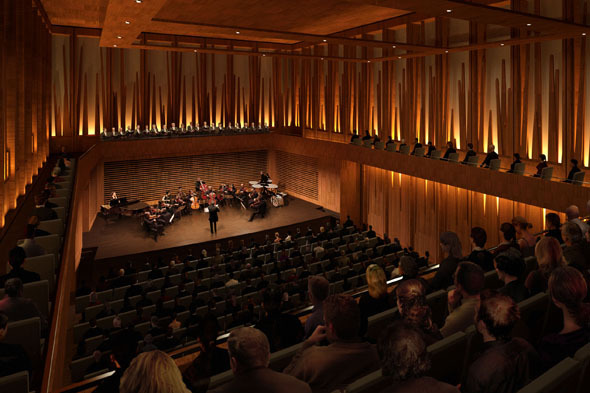 The acoustics of Siansa National Concert Hall are engineered by Arup Acoustics.